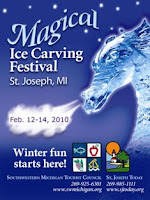 What better way to spend Valentine's weekend than at the Magical Ice Carving Festival in St. Joseph, Michigan! We had a wonderful weekend checking out the ice carvings and trying to photograph them. Unfortunately, we were unable to get into town in time to see the "fire and ice" opening ceremonies Friday evening. The organizers assembled several blocks of ice and lit a fire inside them. It was probably awesome to see. I was only able to grab a picture of it the day after. Maybe next year we'll be able to see it ablaze. We were lucky that the sun came out both Saturday and Sunday making for lovely pictures of the ice carvings. Just look at this beauty. Nature's spotlight makes it sparkle! Doesn't that look like fun?! Monday was President's Day and a holiday for some (like us :-) . We went into town to photograph the ice carvings that were done Sunday afternoon that we hadn't gotten yet. Unfortunately the sky was overcast and the pictures weren't quite as colorful. We still had a good time though and had a nice conversation with a fella from St. Joe Today. By the way, St. Joe Today has moved to their new digs in town at the south end of State Street. Ok, just two more pictures that really give you a feel for the town of St. Joseph. First, where else can you find an Elvis snowman? The ice carving festival was a really nice event for St. Joe. I can see why it's so popular! Cool beans!! We saw this two years back and it was the trip that began our love affair with St. Joseph. Thanks for this post Jasia. It takes me back to my first visit to this fair town. I know we can't get back this summer, but maybe in 2011.